Today I am sharing with you all one of the most exciting projects as a stylist and fashion blogger. Here is my contest entry for GUESS ONE TO WATCH International fashion blogger contest. 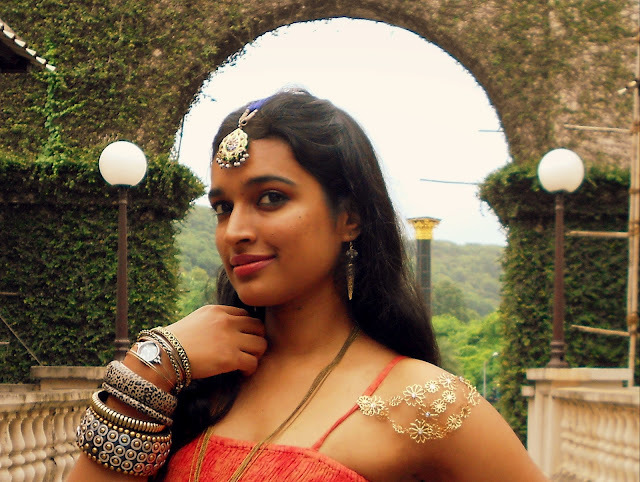 My partner in crime is Surabhi, who loves doing these shoots even at 6 a.m in the morning! I've been a nasty scheduler, you see! Most importantly as I always say, Your views are precious! For a project so different and something that gave me sleepless nights,I am totally looking forward to hearing your opinions! So go ahead and put on your judgement hats ! 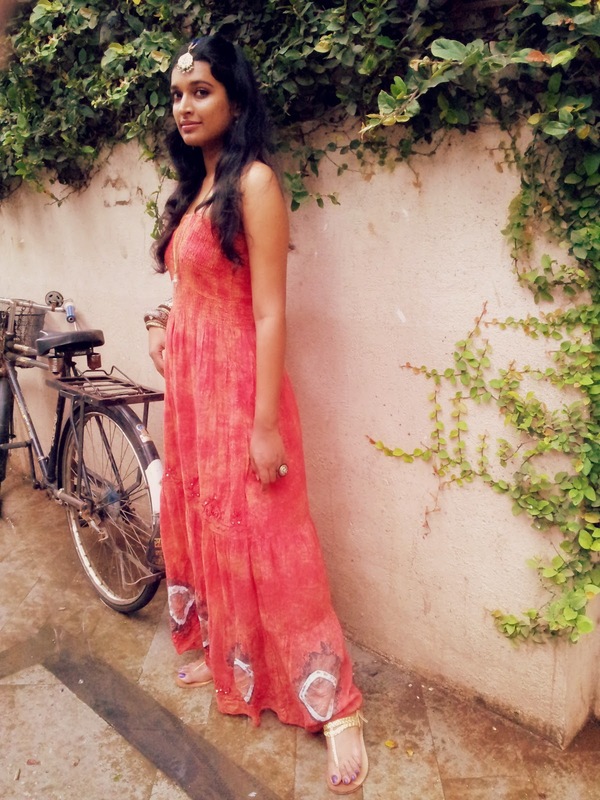 This look has been created with a tangerine tie-dye maxi ,also worn here. 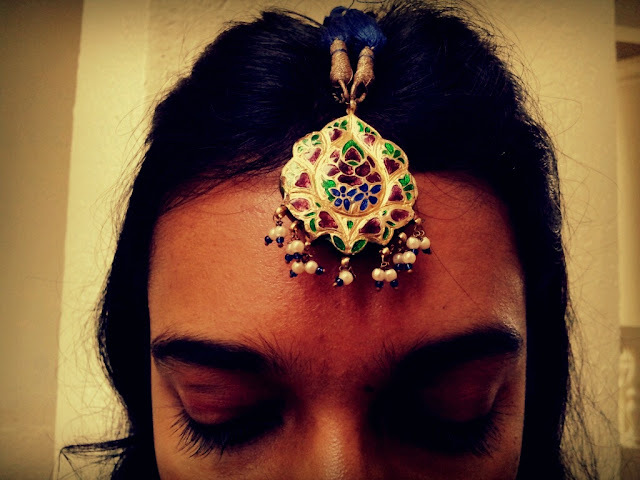 A Meenakari heirloom necklace from my mom has been worn on the forehead as a maang tikka or bena. Animal print leopard bangles are combined with a bangle watch from China (Guangzhou) and a riveted bangle from Delhi's Janpath market. On the shoulder rests a filigree neck-piece from ebay,HK. For any enquiries regarding the look , just drop a comment. Meenakari neckpiece worn as Maang tika ,family Heirloom | Delicate floral neckpiece worn as shoulder-band, Ebay HK| Glass bottle neckpiece ,ONLY| Leopard print bangles, Colaba| Filigree earrings, Tribal Zone, Read about the maxi here. 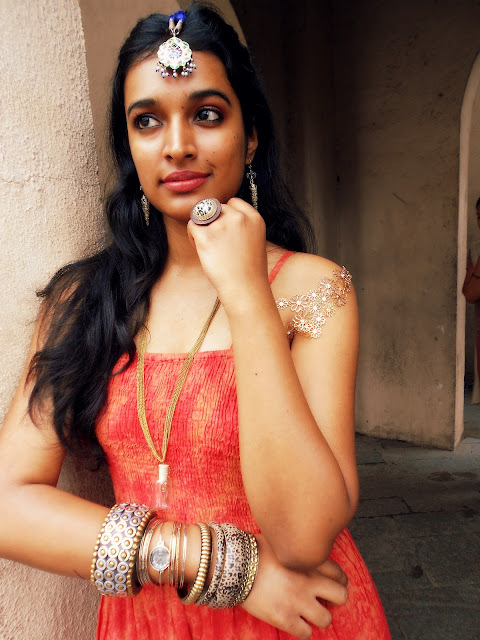 Amidst the candy-colored fun that is seen all over the place in the form of pista- green eye-shadows, lavender gloss, mint nail lacquers, lemon -yellow shorts and baby-pink stilettos, my heart still beats for the color of the year -Tangerine! Gel this with yet another favorite of the fashion houses–the tie-dye and you get what you call a ‘head-turner’ . 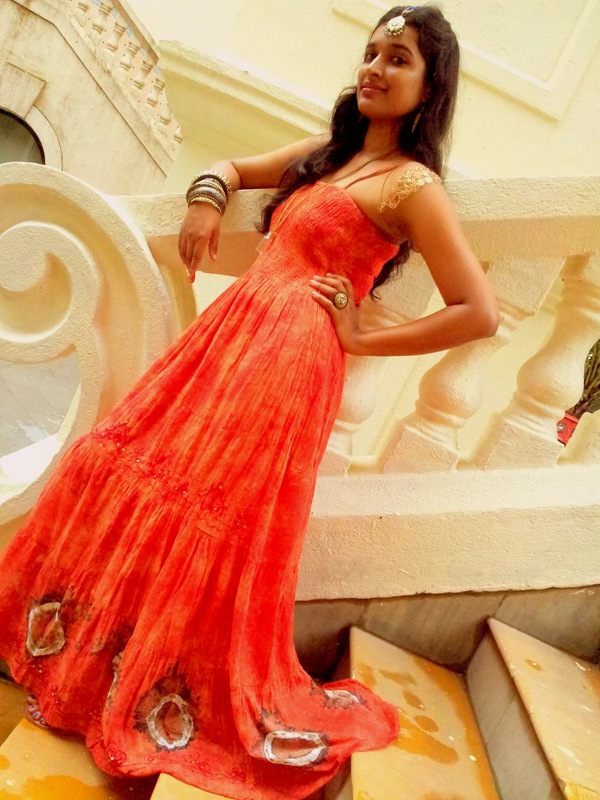 This tie-dye maxi dress in tangerine oozes oodles of earthiness. With a feminine feel to it, It is the ideal day-wear for a lunch-date: Earthy and sensual. Did you just say Animal print? Tangerine works like a charm with earthy elements. Layer your arms with Pale leopard print bangles, moulded metal bangles and the king of them all a larger than life stud wooden bangle. 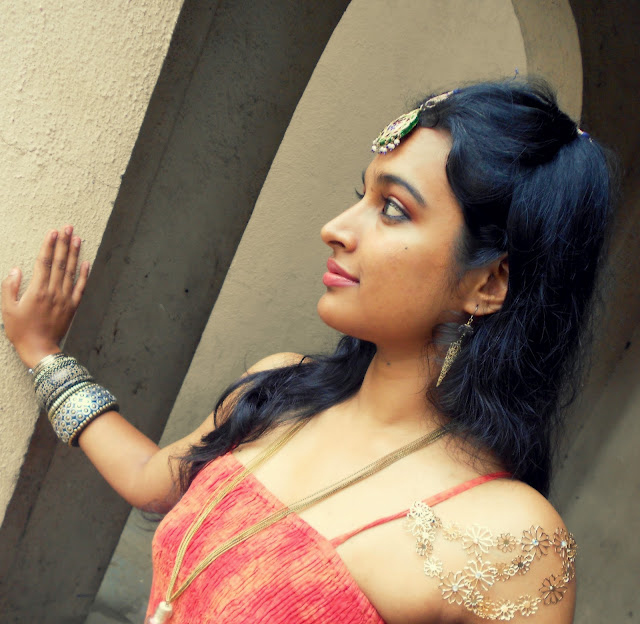 This Fiery Bohemian look can do with some bling , the Indian way. 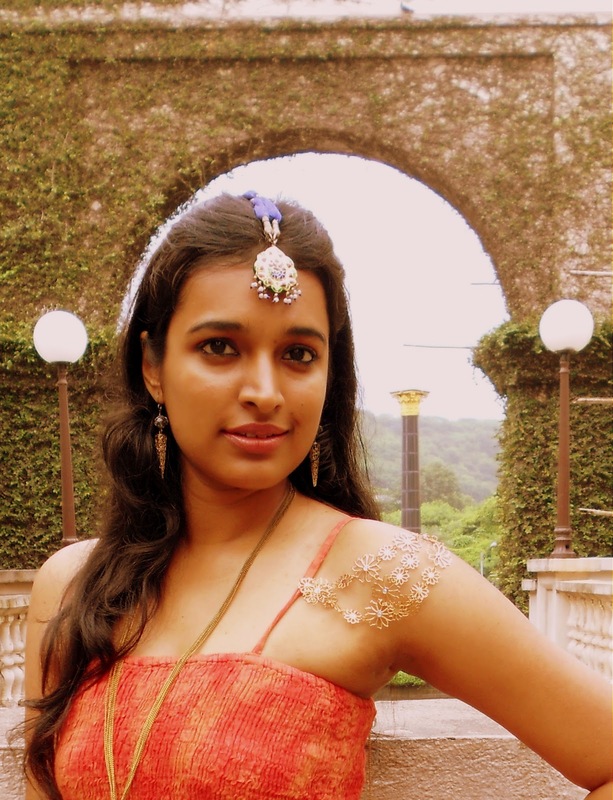 Indian brides are incomplete without a Maang-tikka , a hand-crafted hair accessory made out of precious metals like gold or silver interlaid with semiprecious stones or pearls. The Maang Tikka exudes an enigmatic charm just enough to blind the groom before he sets his eyes on the bride! Don’t you agree? So are you ready to stun Mr. Right? Hey sweetie, this is one of my fave looks by you. Plus, you have a great sense of style and accessorising. Keep up the great work. 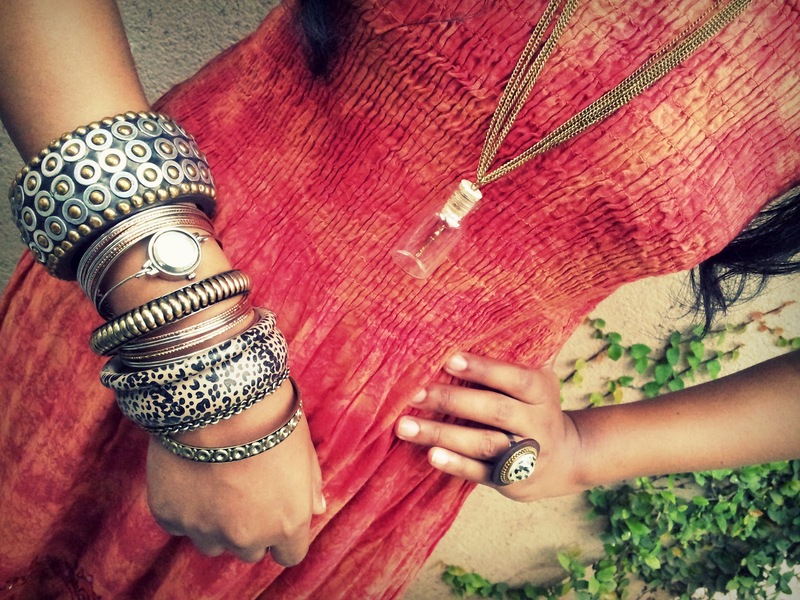 So hippy and ethnic at the same time. Definitely approve! This is a great info regarding Jewellery. It's of crucial reference regarding online material similar to mang tika. Thanks for posting it on your blog.